Deja vu! — What Is “Déjà vu” And What Does It Mean? “Been There, Done That” So What Exactly Is Deja vu? Have you been experiencing Deja vu? 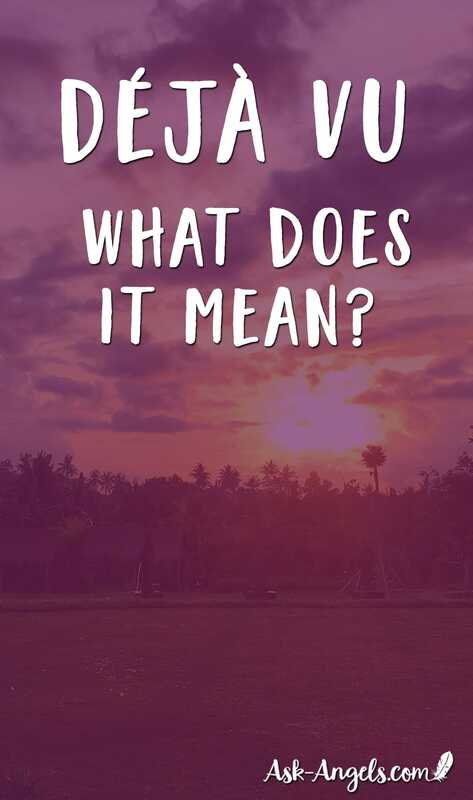 Are you wondering what it means or why it’s happening? Keep reading to find out! Déjà vu is a common extrasensory experience, that happens to many. In this case, I had previously dreamt of that exact moment in time … I’d seen it through my own eyes and lived it already through a precognitive dream. For me, this was a signpost and indication of being on the right track. I've recently made some big life changes and took this to be a beautiful validation of my new direction. It was on the night of the full moon, and I was staying in a beautiful villa overlooking the jungle. Walking around the complex, I was drawn to an archway leading towards the garden and rice paddies. As I walked up the steps towards the arch, I suddenly had an intuitive flash. I remembered walking up those steps under the light of the Full Moon, only my memory was from long ago, in a past life experience. It is accurate to describe it as experiencing the past in your present. It’s best described as uncanny, or strangely familiar when it happens. Logic tells you that the situation you’re in is happening for the first time, but some other sense is telling you that you’ve been there, said that, or seen something before. Deja vu occurs for both adults and children – in fact, upwards of 70% of people report experiencing déjà vu at some point in their life. Deja vu can be triggered through any of our senses, including taste, smell, sound, and touch. Perhaps it’s a particular voice, a familiar sight, or a certain sound that triggers your memory and deja vu experience. Meeting someone for the first time but knowing you’ve met them before. Talking with someone and feeling like you’ve said those exact same sentences previously. Hearing a song that recalls people or places that you don’t recognize but feel familiar. Experiencing a situation and suddenly knowing, you’ve already been through it. Visting a place for the first time, and recalling you've been there previously. When déjà vu occurs, it sparks a memory of when you’ve previously experienced whatever is happening in the present moment. So What Does Deja Vu Mean? Déjà vu is a miraculous and beautiful glimpse into the depths of your soul and an indicator of a previous life, or precognitive experience. 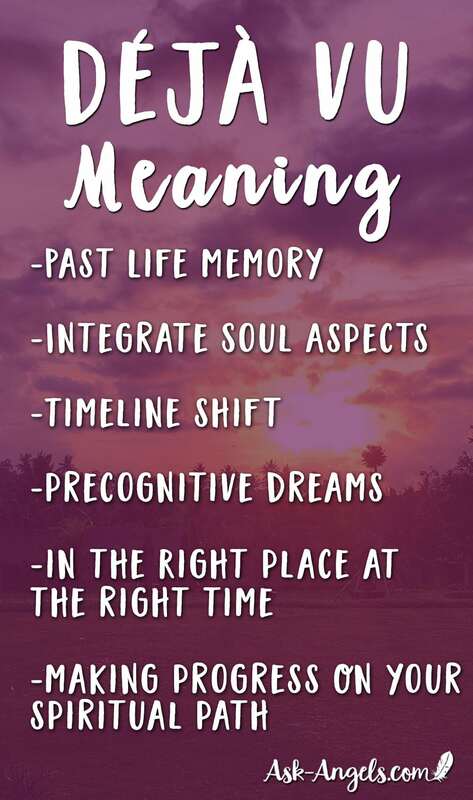 Deja vu is a sign to pay attention in the present moment, as something significant is happening! Perhaps you’re being given an opportunity learn a key lesson, experience completion in some way, or shift into greater alignment with your highest light. Of course, you have to be aware enough to notice! When you begin to pay attention to déjà vu as a message from your divine self, there is a great deal of emotional healing that can occur. Your subconscious is relaying messages to your conscious mind in the form of these ‘already seen’ moment or memories. It’s easy to dismiss them as coincidence. But when we do, we miss their spiritual significance. Next time you experience déjà vu, stop, and consider that the synchronicity of such a moment is rare, and therefore special. It’s a feeling of familiarity that is letting you know that you are exactly where you need to be. Think of déjà vu as a signpost that you are on the right spiritual path. You have the support of your spirit team and angels as well as the wisdom and knowledge needed to be here on Earth now. It is your responsibility to interpret the message at the moment of déjà vu. Is it a marker for change in your life? Validation of the direction you’re heading? Just remember, your soul planned this repeat moment just for you. The divine is supporting you and wants you to decode the message. Just having the awareness of a past memory can open a window to your higher self. Each experience of déjà vu is an opportunity to increase your understanding and connection to higher consciousness. Simply put, it’s your soul connecting with your physical self on a deeper level. Often, when viewed this way, déjà vu helps you see life more clearly. It can even guide your decisions, heal emotional wounds, and unblock patterns. We learn from our history. Why not learn from the history of a past life? This mysterious sign has come to you from your angels, ancestors, and guides. They’ve chosen it for you, now, in this life, to guide you and support you. What If You've Never Had Déjà vu!? Even if you've never experienced deva vu, this doesn’t mean that this is your first life. Every being has already had multiple lives here on Earth and in the spirit realm. If you’ve never experienced déjà vu, it means that your angels and guides didn’t arrange for this kind of reminder or marker during this particular journey (at least not yet). Let this be your motivation to look in other areas where your signs ARE coming from. Rest assured, no being is here alone. You have a team dedicated to your soul’s journey. They are talking to you in some other way. For you, now, other markers make more sense. In fact, if you stop now and think, you’re likely to realize where your markers have been coming from. Other coincidences, synchronicities, epiphanies, life-changing events, and a-ha moments. Your spirit knows no boundaries, even though your physical body does. Your spirit experiences so many things simultaneously and on so many different levels. The mind can’t always grasp this – thus that uncanny feeling. Experiment with déjà vu. Let it be a window into this boundary-less space that is your source. The Gift of Psychic Dreams – Do You Have it? Thank you for this article. Never really knew this about deja vu. Is it possible that this is the first time on Earth though? And that you had other life experiences on other places? Sometimes I just sense it is all so new here for me. The distractions, challenges etc. It is possible this is your first lifetime on Earth and that your previous life experiences have been elsewhere. There were few times I have had precognitive dreams.